Yes, it is MOI - Queen Trixie, Empurress of Jerusalem, Israel and the Entire Middle East, Guardian of the Boudoir, Alpha Kitty Extraordinaire, and I am here to tell you some more about the Visit of Our Guest, Joanie's Travelling Cow, Moo. As you know, Moo has been with Us some weeks already, and she has been enjoying herself so much that - with the purrmission of Joanie and her Human, the Lady Ellen - she has decided to extend her stay for a couple of weeks more. We are so pleased - We think she might enjoy a trip to Tel Aviv while she is here. However, first of all, I must tell you about My Birthday Party/Black Cat Appreciation Day Pawty which took place on Friday, August 17th, up in the Enchanted Forest, overlooking the Old City of Jerusalem (We will be taking Moo to the Old City later this week). 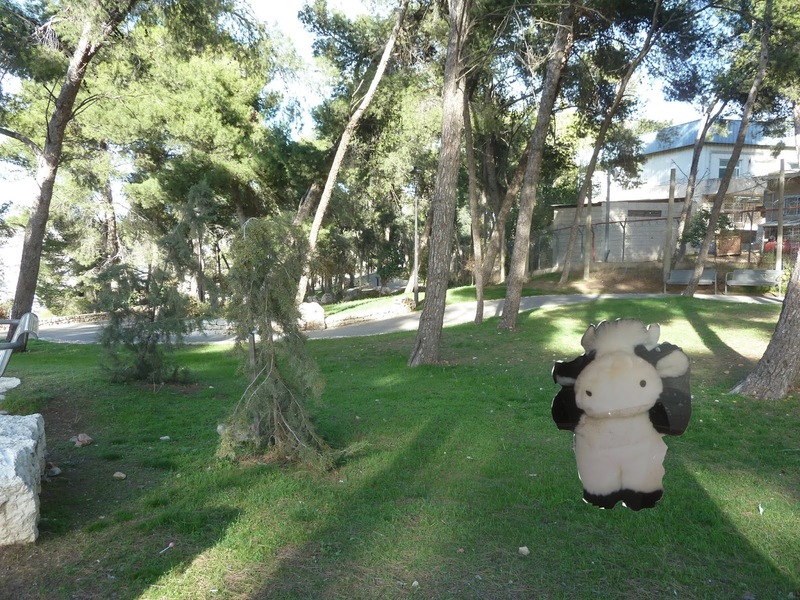 The Enchanted Forest is furry near to where We live and it is also furry near to the Armon Hanatziv Promenade, which is a popular tourist site because of its panoramic view of both the Old City and modern Jerusalem. The pawty was due to start at 6.30 pm, but Caspurr and Shimshi and I took Moo up there slightly earlier, in the late afternoon, so that she could enjoy the view. While We were on the Promenade, We met one of the Promenade Pussycats, who kindly pointed out all the sights to Moo and whom We invited to the Pawty. Moo was furry impurressed by what she heard and is really, really looking forward to seeing some of those sights at close quarters later in the week. After that, We made Our Way up to the Enchanted Forest. Moo tasted the grass there and said it was much juicier than the grass she had sampled in Independence Park earlier this month. Of course, We have been experiencing some furry hot weather, which has, not surprisingly, affected the quality of the grass - but naturally, the Enchanted Forest (being, well - Enchanted!) hasn't been so badly affected. And the wild catnip which grows there has actually produced a bumper crop (MOL). Moo was intrigued by the Stone Frog and she and I posed there for a joint Selfie. Can you see the Stone Froggie in the background? You have to be at exactly the right distance to appurreciate its Frogginess. Too far - or too near - or in the wrong light - and it just looks like an ordinary rock. Because it's Magic. And this is an Enchanted Forest. At night, by starlight, it comes to life. But on Friday, the Magic starts at sunset, with the Sabbath. So it's a furry good thing that my pawty took place on a Friday evening, as the sun began to set, and that Moo could enjoy all the wonders of that special time and place. Not to mention the lovely food - the cod canapés and the salmon sushi and the tuna pies and the chick-hen casseroles and the Cream Cheese Cake and the micecream and the special Grass Cake for Moo... And of course the drinks - the niptinis and the catmint juleps and the silvervine wine, et CATera, et CATera, et CATera. And now all of you can enjoy it as well. Oooooo! That Enchanted Forest looks like a wonderful place. We bet Moo really enjoyed herself there. What a fun time. And *I* got the leftovers! I did. Scarfed 'em up I did.